These divisions are known as the three states of the Church, especially within Catholic ecclesiology. In systems of theology which reject the doctrine of Purgatory, such as Lutheranism, the Churches Militant and Triumphant are together known as the two states of the Church. These divisions are often discussed in the context of the doctrine of the communion of saints; although Christians may be physically separated from each other by the barrier of death, they nonetheless remain united to each other in one Church, and support each other in prayer. The term penitent (Latin: poenitens or paenitens means "repenting, being sorry". Those who constitute the Church Penitent are in Purgatory to satisfy whatever portion of the temporal punishment due for their sins was not satisfied before death. They are in a process of purging their imperfections before entering heaven. It is held that all members of the Church Penitent will eventually join the Church Triumphant. The alternate term suffering (Latin: dolens, lit. 'grieving') emphasizes the nature of souls' experience in Purgatory; they are suffering the temporal consequences of their sins to redemptive effect. The other alternative, expectant (Latin: expectans or exspectans), emphasizes that the souls of Purgatory are awaiting expectantly the beatific vision of heaven. 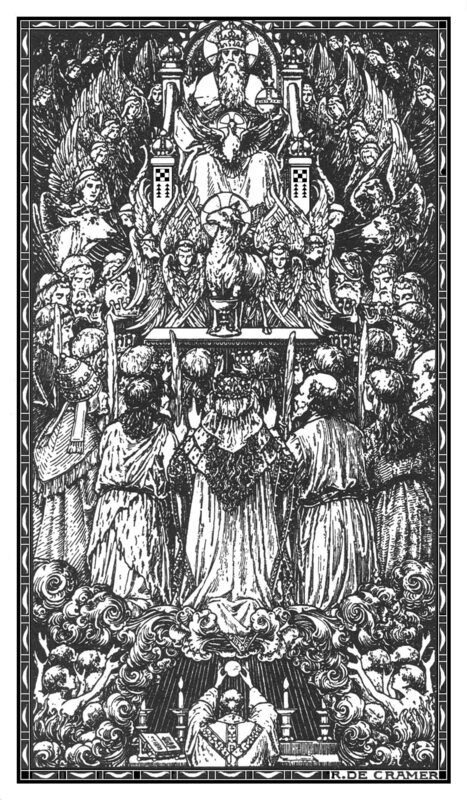 Anglicans believe that "...the Church on earth is united with the Church in heaven, ('sanctorum communio'). They speak of the 'Church Militant here on earth' and the Church triumphant in heaven. They worship God together with 'angels and archangels, and with all the company of heaven.'" The three states of the Church. "When the Lord comes in glory, and all his angels with him, death will be no more and all things will be subject to him. But at the present time some of his disciples are pilgrims on earth. Others have died and are being purified, while still others are in glory, contemplating 'in full light, God himself triune and one, exactly as he is'." Eric Lund, a Lutheran professor, described an analogy relating the Old Testament to the New Testament: "God ordered two altars to be placed in the tabernacle. Fire was transferred from the outer one to the inner one. God also assembled a twofold church: the church militant and the church triumphant. The fire of love will someday be transferred from the church militant to the church triumphant." As such, within Lutheranism, "That is called the Church militant, which in this life is still fighting, under the banner of Christ, against Satan, the world, and the flesh." Likewise, "That is called the Church triumphant, which, being transferred to heavenly rest, and relieved from the labor of fighting, and the danger of being overcome in heaven against all contending powers." Heinrich Schmid, a Lutheran theologian explains that the Church Militant derives her name from spiritual warfare, citing Ephesians 6:10, 1 Peter 5:8–9, 1 John 5:4, Romans 7:14, and Galatians 5:17; he further states that the Church Triumphant derives her name from spiritual victory, citing Revelation 2:10, Revelation 4:4, and Revelation 7:9. The Seventh-day Adventist Church defines the terms in the following ways, "While in this world the church is a militant church, daily engaged in the battles of its Lord, and in warfare against satanic agencies. Its members are in constant conflict with the world, the flesh, and the powers of evil (Rom. 7:15–23; Gal. 5:17; 1 Peter 5:8, 9; 1 John 5:4; cf. 1 John 4:4). If this side of the Lord's return the church is the militant church, the church of the New Jerusalem is the triumphant church. It is made up of faithful disciples and conquerors in this worldly battle. They have exchanged the sword for a palm of victory (Rev 7:9) and the cross for a crown (2 Tim. 4:8; 1 Peter 5:4). The battle is over, the mission accomplished (Matt. 25:21, 23) and the redeemed, invited to the wedding feast of the Lamb (Rev. 19:9), eat and drink at Christ's table in His kingdom (Luke 22:28–30) and reign with Him for ever and ever (Rev 22:5)." Thus, the Seventh-day Adventist view is that the church is the Church Militant until the general resurrection at the end of the present age. The church becomes the Church Triumphant only after the second coming of Christ. The two states account of the church was adapted by Anatoly Lunacharsky to distinguish between a socialistic culture of the future (Ecclesia triumphans) and proletarian culture of the proletariat struggling in the present against capitalism (Ecclesia militans). This theoretical approach was used in the development of Proletkult. ^ a b "CCC, 954". Vatican.va. ^ Hendrix, Scott H. (1974). Ecclesia in Via. Brill Archive. p. 225. ISBN 9789004038653. Since the link between the two states of the church is not sometehing inherent or interior in the faithful themselves, but comes to them from outside and beyond them, Luther describes the militant church as a testimonium, and not as an image, of the triumphant church. This description of the relationship between the two churches does justice both to the discontinuity between life in fide et spe and life in re and to the function of the eternal res (and to the Word of Christ) as the "external" link between the two states of the church. ^ Lewis, Charlton T.; Short, Charles, eds. (1879). "mīlĭto". A Latin Dictionary. Oxford: Clarendon Press. Retrieved 1 July 2016. ^ Lewis, Charlton T., ed. (1890). "mīlitō". An Elementary Latin Dictionary. New York, Cincinnati, and Chicago: American Book Company. Retrieved 1 July 2016. ^ Latham, R. E.; Howlett, D. R.; Ashdowne, R. K., eds. (1975–2013). "ilito". The Dictionary of Medieval Latin from British Sources. London: British Academy. Retrieved 1 July 2016. ^ Lewis, Charlton T.; Short, Charles, eds. (1879). "paenĭtĕo". A Latin Dictionary. Oxford: Clarendon Press. Retrieved 1 July 2016. ^ Lewis, Charlton T.; Short, Charles, eds. (1879). "dŏlĕo". A Latin Dictionary. Oxford: Clarendon Press. Retrieved 1 July 2016. ^ Lewis, Charlton T.; Short, Charles, eds. (1879). "trĭumpho". A Latin Dictionary. Oxford: Clarendon Press. Retrieved 1 July 2016. ^ Alvis, Gary (2000). The Anglican Understanding of the Church: An Introduction (Kindle ed.). London: SPCK Publishing. p. Chapter 7. ISBN 978-0-281-06815-9. ^ Lund, Eric (2011). Seventeenth-Century Lutheran Meditations and Hymns. Paulist Press. p. 137. ISBN 9780809147298. ^ a b c Schmid, Heinrich (1876). The Doctrinal Theology of the Evangelical Lutheran Church. Lutheran Publication Society. p. 603. ^ Billington, Raymond (23 September 2014). The Liturgical Movement and Methodism. Wipf & Stock Publishers. p. 74. ISBN 9781498205016. ^ Handbook of Seventh-day Adventist Theology (Hagerstown, MD: Review and Herald, 2000), pp. 565–566. The Four Marks of the Church first expressed in the Nicene Creed are that the Church is One (a unified Body of Particular Churches in full communion of doctrines and faith with each other), Holy (a sanctified and deified Body), Catholic (Universal and containing the fullness of Truth in itself), and Apostolic (its hierarchy, doctrines, and faith can be traced back to the Apostles).Thus, the majority of Christians globally (particularly of the apostolic churches listed above, as well as some Anglo-Catholics) consider the Christian Church as a visible and institutional "societas perfecta" enlivened with supernatural grace, while Protestants generally understand the Church to be an invisible reality not identifiable with any specific earthly institution, denomination, or network of affiliated churches. 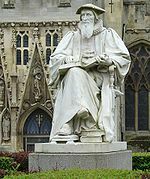 Others equate the Church with particular groups that share certain essential elements of doctrine and practice, though divided on other points of doctrine and government (such as the branch theory as taught by some Anglicans). Most English translations of the New Testament generally use the word "church" as a translation of the Ancient Greek: ἐκκλησία, translit. ecclesia, found in the original Greek texts, which generally meant an "assembly". This term appears in two verses of the Gospel of Matthew, 24 verses of the Acts of the Apostles, 58 verses of the Pauline epistles (including the earliest instances of its use in relation to a Christian body), two verses of the Letter to the Hebrews, one verse of the Epistle of James, three verses of the Third Epistle of John, and 19 verses of the Book of Revelation. In total, ἐκκλησία appears in the New Testament text 114 times, although not every instance is a technical reference to the church.In the New Testament, the term ἐκκλησία is used for local communities as well as in a universal sense to mean all believers. Traditionally, only orthodox believers are considered part of the true church, but convictions of what is orthodox have long varied, as many churches (not only the ones officially using the term "Orthodox" in their names) consider themselves to be orthodox and other Christians to be heterodox. The communion of saints (Latin, communio sanctorum), when referred to persons, is the spiritual union of the members of the Christian Church, living and the dead. They are all part of a single "mystical body", with Christ as the head, in which each member contributes to the good of all and shares in the welfare of all. The earliest known use of this term to refer to the belief in a mystical bond uniting both the living and the dead in a confirmed hope and love is by Saint Nicetas of Remesiana (ca. 335–414); the term has since then played a central role in formulations of the Christian creed. Belief in the communion of saints is affirmed in the Apostles' Creed. The word "sanctorum" in the phrase "communio sanctorum" can also be understood as referring not to holy persons, but to holy things, namely the blessings that the holy persons share with each other, including their faith, the sacraments and the other spiritual graces and gifts they have as Christians. (variants Deus le volt, Dieux el volt; Deus id vult, Deus hoc vult, etc.) is a Catholic motto associated with the Crusades, more specifically with the First Crusade of 1096–1099. The phrase appears in the Vulgate translation of the Christian Bible.